MINNEAPOLIS - "You're welcome," Josh Beckett called out to Jed Lowrie across the clubhouse. Lowrie had just been handed an unmarked, slightly scuffed baseball, not long after trainer Paul Lessard had handed him one with an inscription nicely lettered on it. Lowrie seemed a bit confused. Which one was the right one? The first one, as it turned out, was the one exchanged for a Beckett-signed baseball and, oddly enough, the only one of the four solo home runs hit by the Red Sox last night that was not thrown back onto the field. Clearly, someone in the stands knew the gold that he held. But, more than the back-to-back, game-tying, and tiebreaking home runs from Coco Crisp and Lowrie in the seventh inning, it was the sudden power and efficiency from Daisuke Matsuzaka and the return to form of Jonathan Papelbon that helped finish off a 5-2 win for the Red Sox in the Metrodome. "On a really aggressive hitting team, I thought [Matsuzaka] established early that he was going to throw strikes, got ahead more often than he didn't," manager Terry Francona said. "I thought as the game progressed, he got into the flow of it, got into his delivery." And didn't walk batters. One game after Matsuzaka issued eight walks over five innings in a win over the Tigers, Matsuzaka gave up just three free passes, all in the first two innings. He threw 96 pitches over seven innings, a remarkable reversal for him. But as he finished the bottom of the sixth inning, the Twins were still leading, 2-1, one run coming on a bases-loaded walk (in the second inning) and the other on a Matt Tolbert double and Justin Morneau single in the fifth. Good thing the bottom of the order was leading off. Of all the Red Sox likely to combine for the team's second back-to-back home run performance this season, there were far more likely duos than the one who did it. David Ortiz and Manny Ramírez. 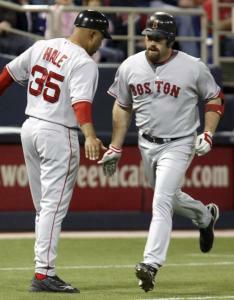 Mike Lowell and Kevin Youkilis. Heck, even Jacoby Ellsbury and Dustin Pedroia. But, no. It was Crisp, hitting his first homer of the season, lashed straight out to left field to open the seventh. That was followed by a new experience for Lowrie, a replacement for the concussed Julio Lugo. With the score tied at 2, Lowrie hit a 352-foot home run to left field. It was his first career homer in the big leagues and it came on a curveball that Twins starter Glen Perkins called his best of the night. Only entered into the lineup just before 4 p.m. local time, Lowrie had three hits the night before he might get a ticket back to Pawtucket, given the impending returns of Alex Cora and Sean Casey. And how do you know those home runs came from surprising sources? Just listen. "When I was rounding first, I really didn't know where the ball was," said Lowrie, whose double in the fifth ended an 0-for-11 streak. "Once I got around second, that's where I kind of knew I got it. You're also like, am I running too slow? I don't want to pivot, it's my first one. At the same time I don't want to run too fast." "That was probably the farthest ball I've ever hit," Crisp said. "But I haven't hit a home run in about 300 at-bats or so [actually just 114]. You kind of forget how to run around the bases. They were getting on me because I ran too slow. I kind of delayed the game about 10 minutes." It still came in as one of the shorter games of the Red Sox season, a tidy 2 hours 44 minutes that could have been a few minutes shorter. But, after Papelbon had come in and gotten the first two outs of the ninth, including his first strikeout in his last five outings, there was one of those plays that only happen in the Metrodome. Mike Lamb, Friday night's hero for the Twins, hit a popup that scraped a wire on the Metrodome ceiling, and ended up falling next to Jason Varitek for a single. But it didn't take long for Craig Monroe to strike out swinging, and stop Papelbon's string of two straight blown saves and two straight losses. "I said [Friday] night it was a simple adjustment," Papelbon said. "I needed to finish my balls through the zone, so I went out today and made the adjustment. It was a totally different outcome." Because with Papelbon on his game and the sudden slugger Youkilis - six home runs in his last seven games - and Lowell adding solo homers of their own, and a fifth run coming across on a Pedroia single after a Lowrie single, the Red Sox had plenty to beat the Twins. So even if a Papelbon save was a safe bet, it was an unlikely offensive night. Or at least, there was an unlikely source for back-to-back home runs. "I'm not an oddsmaker, but obviously somebody would have made a lot of money if they would have put a dollar on it," Lowrie said.